Has everyone recovered from their Thanksgiving holiday? Today, as you may know, has been dubbed "cyber Monday," a day feauturing online deals. 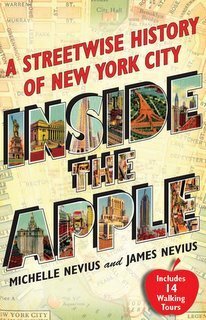 If you are shopping for your friends who love New York, why not a copy of Inside the Apple? You may already have one (you do, don't you?) but maybe other NYC fans aren't so fortunate. The New York Times called Inside the Apple "a smart and entertaining window on the city of the past." Library Journal's "BookSmack!" praised it as "well written, readable, and interesting.... The book's final section of 14 walking tours brings these abstractions alive. Each location has its degree of awesome." Today, Amazon.com is offering 30% off any single book if you use the promo code BOOKDEAL. That would take Inside the Apple down to $8.56--a real steal. Follow this link to Amazon. 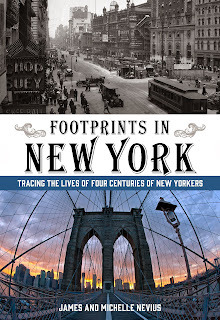 Our forthcoming book, Footprints in New York: Tracing the Lives of Four Centuries of New Yorkers, doesn't come out until April 15th next year, but if you order it at Amazon.com today using the BOOKDEAL promo code, it will come out just $8.39--over ten dollars off the cover price. Order it today and it will ship in April when the book is ready. We hope you have a wonderful holiday season! When Footprints in New York comes out in the spring, we'll be conducting special tours, giving talks and signings, and more. We'll keep you in the loop!